About five months ago, OLPC Project started a little experiment. 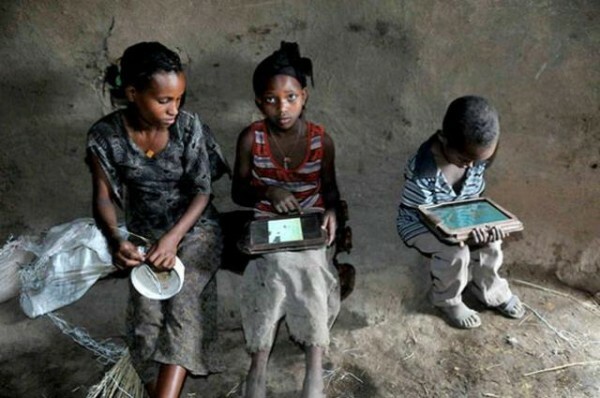 They chose a village in Ethiopia where the literacy rate was nearly 0% and decided to drop off a bunch of Motorola Xooms there. The One Laptop Per Child project started as a way of delivering technology and resources to schools in countries with little or no education infrastructure, using inexpensive computers to improve traditional curricula. On the tablets, there was custom software that was meant to teach kids how to read. This experiment began earlier this year. 1st Four Minutes - One kid had opened the box and had figured out how to turn on the Xoom. In 1st Five Days - The kids were using nearly 50 applications each every day. In Two Weeks - The kids were singing their ABC’s in English. Now its 5th Month - They hacked the Motorola Xooms so they could enable the camera, which had been disabled by OLPC. OLPC founder Nicholas Negroponte at MIT Technology Review's EmTech conference last week: "We left the boxes in the village. Closed. Taped shut. No instruction, no human being. I thought, the kids will play with the boxes! Within four minutes, one kid not only opened the box, but found the on/off switch. He'd never seen an on/off switch. He powered it up. Within five days, they were using 47 apps per child per day. Within two weeks, they were singing ABC songs [in English] in the village. And within five months, they had hacked Android. Some idiot in our organization or in the Media Lab had disabled the camera! And they figured out it had a camera, and they hacked Android." OLPC founder Nicholas Negroponte never did mention whether the experiment was a success or not, but what OLPC really want to see is whether these kids can learn to read and write in English.